At the Cook Pioneer Hall. May 7th. 11am to 3pm. Come meet fellow members, bring your talents, goods, food to exchange. A charge of $3 and 10 ecos per stall can cover costs. This is a great chance to meet new members, it’s always fun. 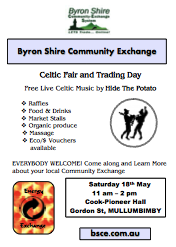 Please contact Amber 0405 773 635 to book your stall or email bsce@communityexchange.net.au or Amber (member no 0799). Look forward to seeing lots of new faces. This entry was posted in News & Events on April 13, 2016 by jasonadmin. Come along and meet more traders, promote your skills and/or bring some second hand goods, crafts or food and drink to sell. Shade provided for small stalls. Please contact Eleanor at Admin if you are interested in having a stall. 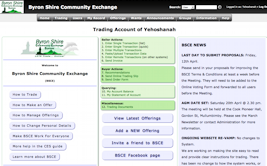 Come along & Learn More about your local Community Exchange. FREE to join and trade. This entry was posted in News & Events on October 24, 2013 by jasonadmin. This entry was posted in News & Events on April 25, 2013 by jasonadmin.